Optional overdraft protection for your DCU Checking – We’ll transfer the balance of any overdrafts from your DCU Visa Platinum account up to your available limit. Compatible with Apple Pay®, Google Pay™, and Samsung Pay – Use your mobile device to pay at millions of retailers throughout the country. Learn more. Embedded EMV chip for fraud protection – This tiny chip protects your information in a big way. 1 - Annual Percentage Rate. 2 - Actual APR (Annual Percentage Rate) based on creditworthiness. Most vary with the Prime Rate. Citizens varies with LIBOR. Chart updated as of 6/26/2018 and is subject to change without notice. For more information, please refer to DCU's Visa Credit Card Agreement and Federal Truth-in-Lending Disclosure Statement. DCU Visa Platinum is rated 4.6 out of 5 by 1431. Rated 5 out of 5 by Dayhana16 from This product is amazing and it has no fees on its major features. The credit card is amazing, it is helping me save money by doing a balance transfers. I'm sick of big banks and their high interest rates and unnecessary fees. 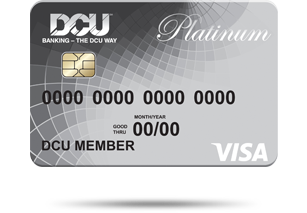 DCU has provided me the platinum credit card that has a low interest rate and a higher credit line as well. I am overall grateful and happy with this product. Rated 5 out of 5 by usama19 from Love it! Awesome features Very nice! No Annual fee, DCU Visa credit card is also good to open if you already a member of DCU. Rated 5 out of 5 by Robert from Great Customer Service Great Customer Service, they go above and beyond, great products. Rated 5 out of 5 by myeliz from DCU Visa Platinum is great asset to have because it is very helpful when you have financial emergencies. Rates are formidable, could use it anywhere Excellent, so grateful to have; glad I switched. I fully recommend. Rated 5 out of 5 by Twynn0107 from Great feature Product was great and the customer service was excellent. The process was fast and the bank representative was very knowledgeable. Can you apply for a credit card if you have ZERO credit? If so, what can you apply for as a limit? Yes, I applied and received this card with zero credit. This is my first credit card and depending on how much you make at work is the amount you are loaned. You need to have a stable job for at least 3 months and have pay stubs to prove it. That's all it took for me! Does your Visa credit card offer a rewards program? how do I apply for a raise in credit limit to my Visa? You could do this on their website under your account management. I have got a Pre-Approval offer for DCU VISA Platinum Credit card. If I accept that offer, is that going to be a Hard Pull or Soft Pull on my Credit? Most probably a hard pull. I have applied for credit card over phone and the card is approved. How can establish membership with DCU? Should i be given membership along with credit card or apply fresh?